Truffles make everything better. Do yourself a favor, if you’re ever eating at Seasons 52, order the arugula truffle salad. You can thank me later. Truffle potatoes are another one of my favorites. 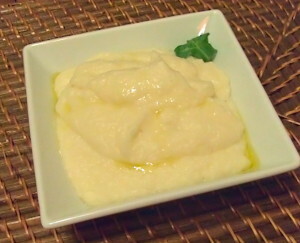 While I do still eat potatoes, I love to make mashed cauliflower. It’s so delicious and lower in carbs. I make different variations of mashed cauliflower and usually just eyeball it and taste-test while I’m making it. I was asked about how I make my mashed cauliflower, so I measured it out to share with you all. 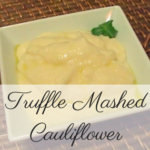 I chose to share my truffle mashed cauliflower because I think it is the best, but sometimes I swap out the truffle salt and oil for Flavorgod Garlic Lover’s seasoning. You can add in whatever seasonings you like to change it up. This recipe is so easy, perfect for weeknight dinners. It pairs very well with grass-fed steak and veggies. This looks amazing. I will definitely have to try this.